← Will it cut the mustard? 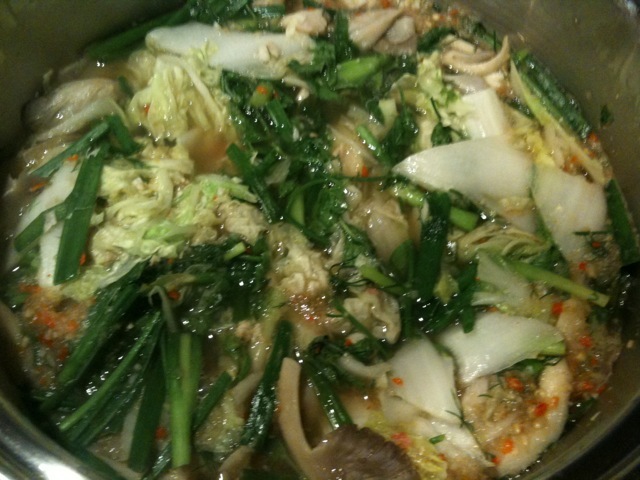 If there’s a good place to start for a Thai food cooking virgin, it’s with this tasty Northeastern Thai “soup”. It’s full of good-for-you greens, bright and light with fresh, herbal flavor, and crazy easy to make. Felt like I robbed a bank with this one. 1. Set water and chicken stock to simmering boil in pot. 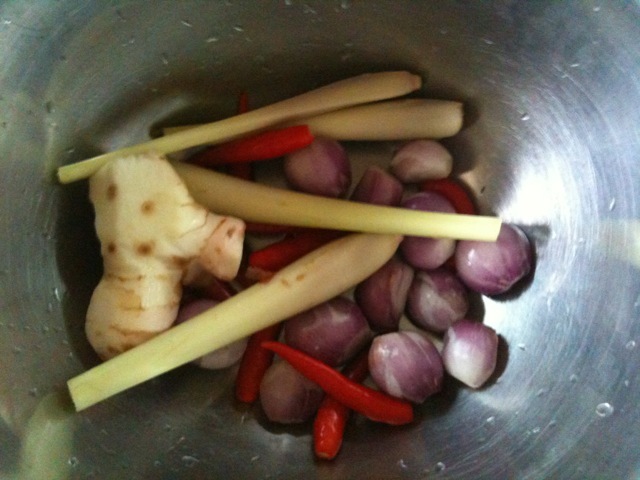 Meanwhile, mix lemongrass, galangal, shallots and chilies in blender or food processor until finely diced. 2. Once simmering boil is achieved, add chili mixture to stock. 3. 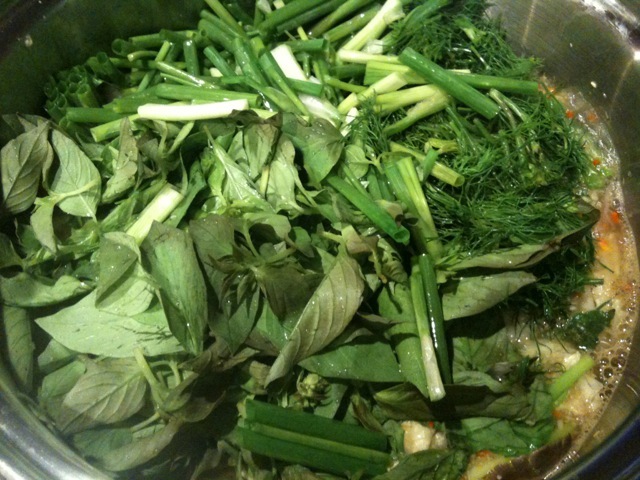 Add pla rah juice, 1 Tbsp fish sauce and fish pieces. Do not overstir, or fish will get mushy. Cover. 4. Increase heat to rolling boil. 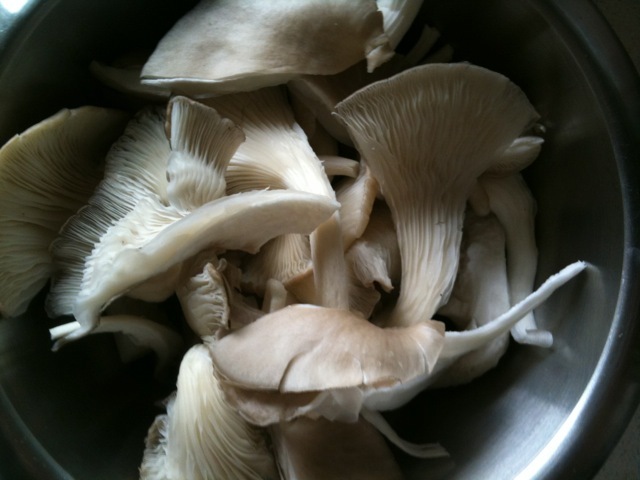 Add mushrooms and white part of scallions. 6. When vegetables lose some volume, carefully “fold” into broth. Taste and add more fish sauce if needed. 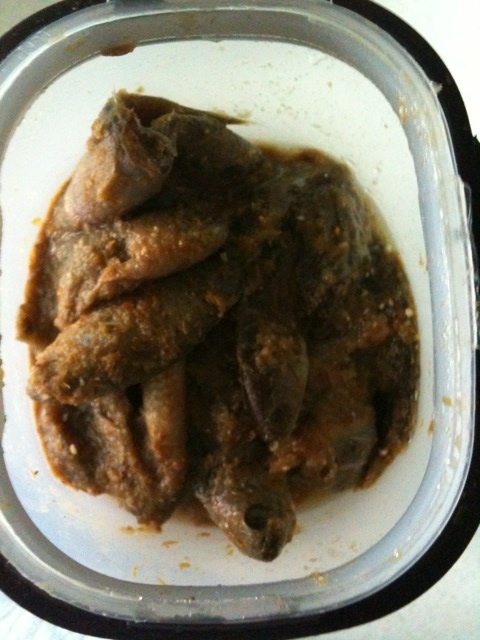 Cover and let “marinate” for a few hours (cool and place in fridge if leaving overnight). *If you’re a meat person, use sauteed chicken wings or pork ribs instead. If this isn’t available to you, try mashing regular good-quality anchovies instead. ***Khum Gon believes that fish sauce from shellfish (such as razor clams) is best because it smells less fishy than other types. Frankly, I am not that sensitive to the smell, but if that is an issue, then take Khum Gon’s advice. In the end, it was … pretty good. I’d use all chicken broth next time. And more Thai anchovy juice. But it was everything I expected and wanted from my first Thai cooking experiment. 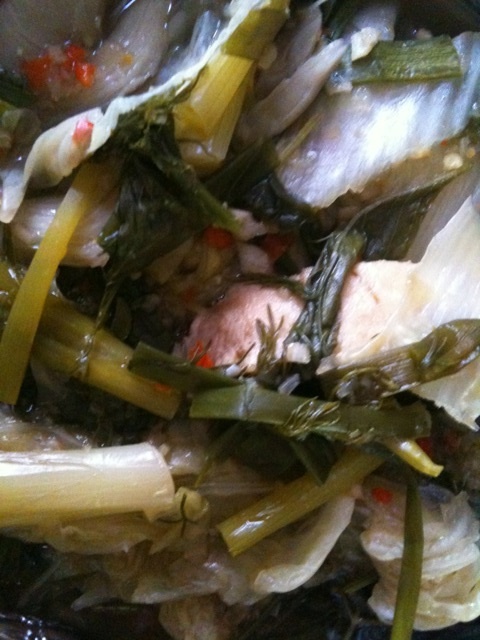 Next up: a veggie-rich gaeng liang. Shouldn’t this dish be called gaeng pa plaa or om plaa. I always understood gaeng to refer to a curry that included coconut milk and gaeng pa (or ba) to be roughly curry of the forest ie without coconut milk. It would make better sense for “gang” to refer to a coconut milk-enriched curry and for “pa” to denote the lack of coconut milk; after all, you could say “tom” (for dishes like tom kloang and tom yum) gets its flavor from infusion and “gang” from a paste. It isn’t a hard and fast rule for all dishes called “gang” though. “Gang om” comes from the Northeast (although Northerners have a version too that I think is adapted from Isaan) and because Isaan typically doesn’t use much (or any) coconut milk, this dish reflects that. However, some Thai “gangs” (like “gang jued”, served to offset spicy dishes) don’t have coconut milk either, so it’s confusing. Sorry for the convoluted answer. Long story short: “Gang pa” is a type of curry without coconut milk, but there are other curries that don’t have coconut milk for various reasons, whether they are regional specialties or meant for children or whatever. Ha! Maybe YOU can make it for ME! Apparently there’s a version of Sicilian fish sauce that’s a bit like the Thai one? Is that true? Great recipe! Is the dill the same as in states? Is there a way to turn regular nam pla from Chinatown to nam pla rah? 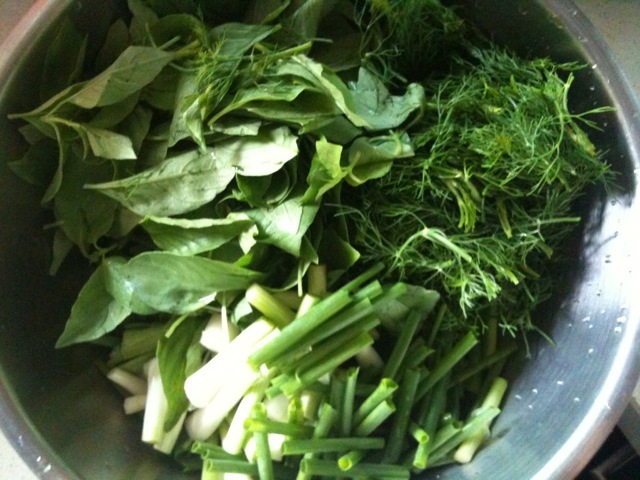 It is the same dill, which is referred to as “pak chee Lao” here. I don’t think you can turn nam pla into pla rah, unfortunately. 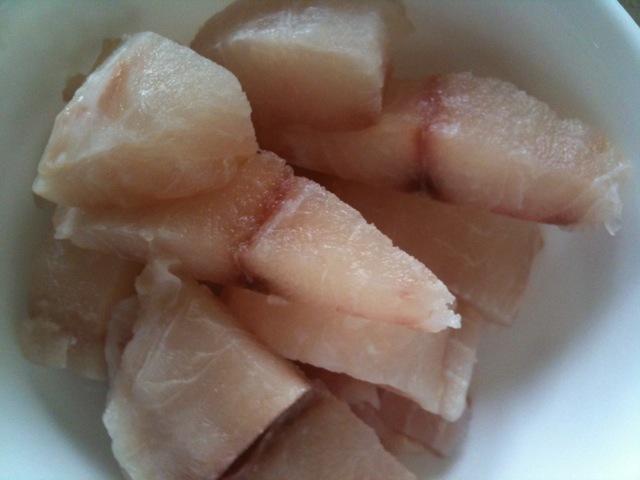 You need to take small fish, salt them, stick them in a jar and bury them for at least three months. That’s the way to make pla rah, I’ve been told. Make sure no one steals them and reaps the bounty of your fermentation! Thanks! 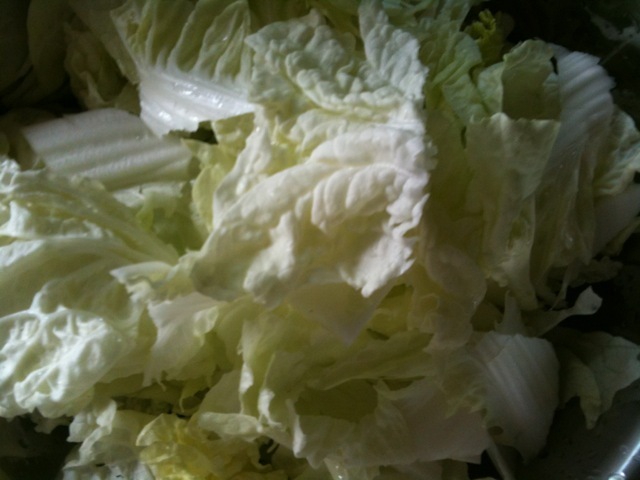 That’s the reason I live this gaeng as well–you get your daily dose of veggies in one dish.